Although this is part of a series, it can stand alone with no problems. 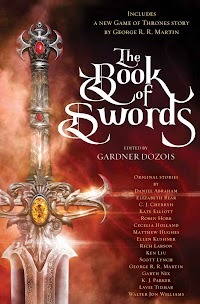 "The Sword of Destiny," by Matthew Hughes [bio] (edited by Gardner Dozois), appeared in The Book of Swords (RSR review), published on October 10, 2017 by Bantam Books. Pro: There’s quite a tangle of different plot lines here. Baldemar just wants to get away from Thelerion and find a way to retire comfortably. Aumbraj simply wants to learn enough about the Sword of Destiny to get a paper published. The Duke wants to extend the spell that keeps him young and in power. The Sword itself wants to be reunited with Azzerath. Only the Duke fails to achieve his goal, but the interactions between these conflicting goals make the story a fun read and as a side-effect develop all the characters nicely. There are all sorts of funny moments, such as when we learn that the motto on the Duke’s coins translates to “mine, all mine” or when Azzerath talks so sweetly to the sword that we suspect they’re lovers. Con: We never form any emotional attachment to any of the characters. Accordingly, there’s no emotional release at Baldemar’s victory.